The ACM History Committee is sponsoring a SIG Heritage workshop to help diffuse knowledge of professional archival practices into ACM&apos;s membership and to others with an active interest in preserving our computer heritage. Applications are invited to 1.5 day workshop to be held 20-21 May 2019 at the Charles Babbage Institute (CBI) in Minneapolis, Minnesota. For each successful application, one person&apos;s expenses for workshop travel, lodging, and meals will be paid by the ACM History Committee. An announcement of 2019 call for participation can be found here (also as a pdf-format document here). Proposals are due by 1 February, 2019. The SIGGRAPH Art Show Archive project is currently well underway thanks to the support of the ACM and SIGGRAPH History Committees. The goal of this project is to preserve the history and achievements showcased at the ACM SIGGRAPH Art Shows from 1980 to the present, and make it accessible to researchers, academics, students, and the community at large. The project we are working on is the development of an innovative online digital archival collection of the art works, scholarly papers and art presentations from the SIGGRAPH and SIGGRAPH Asia conferences, as well as the ACM SIGGRAPH Digital Art Community Exhibitions. Throughout the decades, ACM SIGGRAPH has been documenting art exhibitions and submissions through print media (catalogs) and individually-built conference websites (more recently) which contain minimal information. The older websites are now outdated—currently database driven websites are the norm. Thus it was essential for us to develop an innovative infrastructure and online database to allow for the further documentation and presentation of these scholarly and creative materials. In June 2017, Jan Searleman and Bonnie Mitchell assembled a team of students and have been meeting with them weekly (or more) since then. Some students focus on content acquisition, formatting and management while others concentrate on programming the back-end and interface. The information architecture had already been designed prior to June but evolved significantly to include new information. The team leaders consisted of: Bonnie Mitchell, Professor of Digital Arts, Bowling Green State University and Jan Searleman, Adjunct Research Professor of Computer Science, Clarkson University. The students are all from Bowling Green State University: Troy Yarnell, programmer; Joe Jadach; Interface designer and programmer; Breeana Hinton, content management; Amanda Glass, content acquisition. The ACM SIGGRAPH Art Show Archive team has created a main page for each of the 37 SIGGRAPH Art Shows, 10 SIGGRAPH Asia Art Shows, and 7 Digital Art Community Online Exhibitions. These main pages contain basic information about each of the art exhibitions, including the theme and title, chair(s), location, jury members, committee members, reviewers, acknowledgments, and any available auxiliary information. In addition, we have also entered all information related to 20 of these art shows. This includes 1,783 people pages, 1,455 artworks and 111 writings/presentations. People who have contributed to the SIGGRAPH Art Shows include artists, chairs, authors, speakers/presenters, collaborators, art reviewers, jury members, writing reviewers, committee members and in some cases companies that have submitted design work. Each person has an associated affiliation, location, short bio, personal website, and unique ID from VIAF, ISNI or the Library of Congress, along with any other relevant material. Not all fields for the people entered have been filled in – only the information found in the SIGGRAPH Catalogs. Each artwork has the ability to have an associated digital image, the artist(s) names, type of artwork, collaborators (if any), title, medium, year created, size, artist statement, exhibition year, technical information, process information, contributors, sponsors, keywords and video (if available). Artwork types are 2D & Wall-Hung, 3D and Sculpture, Animation & Video, Architecture, Art Site, Artist Book, Augmented Reality/Virtual Reality, Design, Installation, Interactive & Monitor-Based, and Performance. In some cases, a single artwork may consist of multiple, related images. Writings may include title, author(s), contributors, writing type, affiliation at the time of the writing, session title, abstract, references, exhibition, keywords, and a pdf (if available). Writing types consist of Essay, Panel/Roundtable, Paper, or Sketch/Art talk. Presentations include title, type, presenter(s), abstract, exhibition, keywords, and file. Types of presentations are Panel, Roundtable or Talk. One of the strengths of the approach we have taken is that all data is dynamically connected through taxonomies and data relationships. The page generation is automated through customized templates that tap into the database. The underlying infrastructure allows a user to view all of the artworks and writings for any given exhibition, and search for a person by last name and see all of the contributions that person has made to SIGGRAPH Art Shows throughout the years and more. The archive is also flexible enough to be adapted to be used for other SIGGRAPH and ACM content. At SIGGRAPH 2017 in Los Angeles, Bonnie Mitchell and Jan Searleman organized a panel focused on SIGGRAPH History, “Recapturing Our Past: Archiving SIGGRAPH’s History”. Mary Whitton and Terrance Masson were invited to also present their projects. Two of the students on the Archive team, Breeana Hinton and Troy Yarnell, attended the conference and also assisted with the SIGGRAPH Art Show Archive presentation. Both students received a huge round of applause and thanks for helping preserve SIGGRAPH’s history. The presentation room was full and the attendees were very enthusiastic and eager to learn more about the archive. Now that the architecture of the archive is stable, we plan to continue adding content until all of the SIGGRAPH, SIGGRAPH Asia Art Shows and Digital Arts Community Online Shows are fully entered into the archive. Some of the earliest art shows in the 1980s pose a challenge in that the material was not documented via a catalog. We also intend to experiment with different methods of visualizing the data. For example, a google map containing pins showing the locations of all artists who have contributed material would be interesting. Another visualization would be to develop a timeline that traces how 2D digital art has developed aesthetically from the 80s to the present. Although we have made significant progress, it is apparent that to complete the project, we need more time, personnel, and financial resources. We recently began working with Marla Schweppe at RIT to integrate her student’s digital art history research into the 1980s section of the archive. We have received access to older art catalogs and other materials from Cynthia Rubin, David Em and the RIT Library. We are currently in search of grant money to continue our efforts and complete the entry of the remaining data. An announcement of 2018 call for proposals can be found here. Proposals are due by 1 March 2018. Congratulations to 2017 ACM History Fellowship Winners: Bethany G. Anderson (University of Illinois at Urbana-Champaign), Beth A. Robertson (Carleton University), the team of Bonnie Mitchell (Bowling Green State University)! The current and past winners of the fellowship along with their project information can be found here. An announcement of 2017 call for proposals can be found here. Proposals are due by 15 February 2017. 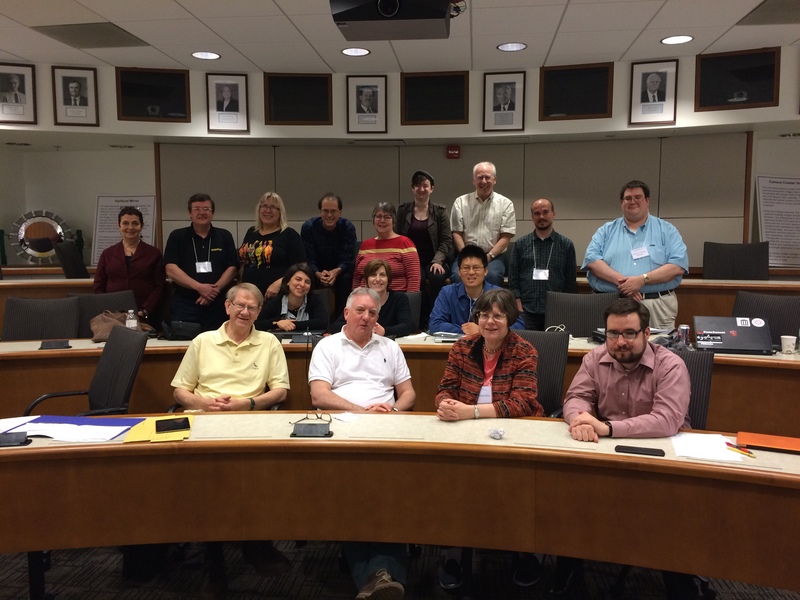 A group of 16 individuals, each interested in preserving some aspect of computing history, met May 12 and 13 in Chapel Hill (NC) for the ACM History Committee sponsored workshop on Doing Oral History. In addition to being of diverse age, gender, and national origin, the attendees were interested in a broad spectrum of projects. Examples mentioned include an oral history of a specific computer company, the stories of the comparatively unknown members of architecture teams who designed important processors, or gathering an oral history of a online game company by talking with many of its former employees. Representing the UK, Italy, and the US, the attendees shared the goal of learning to do a better job of taking oral histories so that the materials will be of maximum value to future researchers. The workshop covered topics such as best practices, e.g., what types of recording devices to use and types of tools that can help identify themes in and across interviews, and hands-on activities such as interviewing and critiquing interviews of each other. The group practiced preparing a blueprint or plan for a given OH project. The history committee itself is benefiting from the workshop, as what we learned leads us to reflect on how we can do a better job on our major project–insuring there is an oral history for each of the Turing Award winners. The workshop organizers were extremely pleased to have as the workshop leader Mary Marshall Clark, Director of the Center for Oral History Research at Columbia University. All were grateful for the work of our gracious host, Mary Whitton, along with the staff of the CS Dept of UNC. Note: a CORRECTION in the book has been made. See the comment below made by Tom Misa (a current ACM History Committee member and a former Committee Chair). The ACM History Committee is sponsoring an oral history workshop to help diffuse knowledge of professional oral history practices into ACM’s membership and others with an active interest in preserving our computing heritage through the medium of oral histories. Applications are invited to a 1.5 day oral history workshop, to be held Thursday and Friday, May 12-13, 2016 at the University of North Carolina at Chapel Hill, North Carolina. For each successful application, one person’s expenses for workshop travel, lodging, and meals will be paid by the ACM History Committee. An announcement of 2016 call for participation can be found here (also as a pdf-format document here). Proposals are due by January 15, 2016.